Datacrushers is excited to announce the release of the new eCommerce focused email marketing automation suite as an add-on to the Datacrushers Revenue Discovery Platform. Our powerful email marketing suite helps streamline the entire process of shopper engagement by continuing to further defragment the complex world of eCommerce analytics and marketing tools. Instead of relying on a 3rd party email marketing provider for your newsletters and welcome series, (sign-up emails), you can now take care of these essential aspects of your business directly from Datacrushers. The new eCommerce focused email marketing suite allows users to close the circle on revenue discovery by streamlining the process of shopper engagement across the full email stack. What does it include to make this all possible? Now, let’s check out what those eCommerce Newsletters are all about! eCommerce Newsletters are an effective way of bringing your shoppers up to speed on the latest offerings from your business. The Datacrushers eCommerce newsletters make the process of effective shopper targeting incredibly easy and accurate. Our smart filters allow your eCommerce business to reach the largest number shoppers possible. The smart filters included in our email marketing suite will also allow you to sort recipients based on shopper behaviors in addition to your subscriber lists. This behavior is tracked by the Datacrushers Revenue Discovery Platform, and can then be applied to the newsletters smart filters across the following parameters. Now let’s expound on that last filter – what exactly does “Engagement Level” mean? Engagement Level refers to a shopper’s interactions with your email newsletters. It has 3 options for filtering the recipients: Low, Medium, and High. First impressions matter. Make sure your customers are getting the right message, the first time! How to contact customer service. Consumer Loan Financing offers (if your business has a consumer-loan Financing partner). Our new email marketing suite brings the fight against revenue abandonment and the revenue recovery process full circle. This means that now, your eCommerce business can fully engage with shoppers across the full email stack. To learn how Datacrushers Revenue Discovery Platform can help your eCommerce business click the banner below. 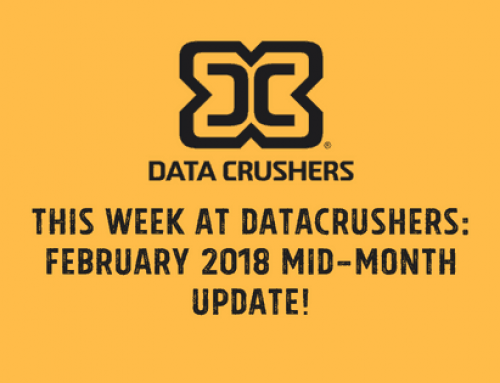 This Week at Datacrushers: February 2018 Mid-Month Update!